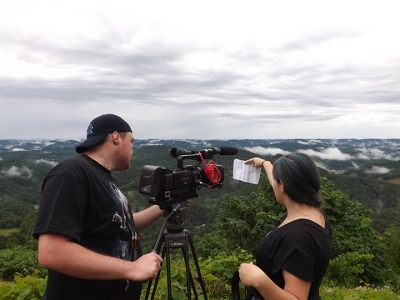 LEXINGTON, Ky. (Nov. 6, 2013) — The University of Kentucky’s Appalachian Center, in collaboration with the Appalachian Media Institute, will provide a glimpse into Appalachia through a showcase of young filmmakers’ documentaries. The event takes place at 3:30 p.m. on Monday, Nov. 11, in Room 106 of the Whitehall Classroom Building. Representatives from AMI’s Summer Documentary Institute will screen three self-produced documentaries, each around 10 minutes long. "Perceiving Perfection," produced by Austin Rutheford, Dustin Hall and Jade Slone, examines the ways mass media and everyday life affect how individuals perceive themselves. "Breaking the Cycle," produced by Alessandra D’Amato, Brian Dunn and Christian Adams, takes a look at recovery from domestic abuse through the stories of a mother and son. "A Mother’s Choice," produced by Drake Hensley, Cassandra Erskine, Nkengafac Lekealem and Aaron Morgan, explores different perspectives and opinions on natural childbirth. After the screenings, there will be a question-and-answer session with Hall and Slone talking about “Perceiving Perfection” and their experience working on the film as a part of AMI this summer. AMI was founded in 1988 by the media collective Appalshop to be a media training program for central Appalachian youth. This year, AMI selected 10 outstanding applicants from the region, ages 14-22, to participate in its 25th Annual Summer Documentary Institute. This program teaches students principles of video production and storytelling, giving them tools to tell the stories of the people in their region. Appalshop is a multimedia arts and cultural organization based out of Whitesburg, Ky., that uses media to address the issues facing the Appalachian region today. Through its technological and artistic resources, Appalshop and AMI help young people explore how media production skills can be used to ask and answer critical questions about themselves and their communities. Through media, AMI participants have the opportunity to hone the skills and critical thinking abilities needed to become leaders in creating sustainable futures in their communities. Since it was founded, AMI has directly engaged more than 600 young people in media production. The UK Appalachian Center works to strengthen relationships between the colleges at the university and the communities in the 54 Appalachian counties of Kentucky by creating community partnerships in collaborative projects documenting and addressing the region’s particular contributions and challenges in a global context. For more information visit the center online at http://appalachiancenter.as.uky.edu.